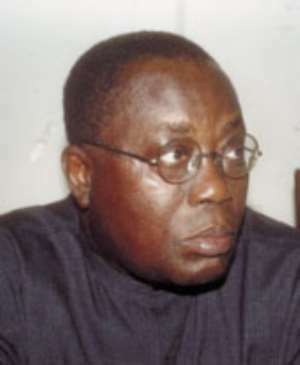 ....to reverse the Clock of progress -Nana Akufo-Addo Nana Akufo-Addo, Honourable Minister for Foreign Affairs has said in London that Ghanaians would not heed calls by the NDC flagbearer to turn back the clock of progress ushered in by the NPP by voting the NDC back into power in the upcoming elections. Nana Akufo-Addo said the President's “bold economic initiatives as well as the fair, firm and sensitive manner” with which he had handled the highest office of the country had endeared him to all sections of the Ghanaian public and put him firmly on the brink of a landslide victory. Other dignitaries present at the event included Hon. Mr. J.H. Mensah, Senior Minister and Chairman of the Economic Management Team, H.E. Mr. Isaac Osei, Ghana's High Commissioner to the UK and his wife Mrs. Marian Osei, Mr. Alex Kwaku Korankye, NPP Member of Parliament for Asante Akyem South and Chairman of the Parliamentary Sub-Committee on Food, Agriculture and Cocoa Affairs and Mr Ampratwum Sarpong, Chairman of the UK & Ireland Chapter of the NPP. Nana Akufo Addo, told the cheering crowd which punctuated his speech and other speeches with chants of “Kufuor nie, Osono nie”, “so far, so good” said the Government of the NPP had delivered on its electoral promises to the people by restoring sanity in the economy and rekindled the hopes of Ghanaians in their ability to improve the quality of their lives. Touching on the major achievements made in the various sectors, Nana Akufo-Addo said the capacity of the Police had been beefed up, the fight against corruption was on course and national health Insurance was poised to take off in January 2005. He said the mass cocoa spraying exercise and other policies introduced by the NPP had propelled cocoa production to an unprecedented high of 730,000 tons, boosted the production of staples considerably and enhanced the development of the rural economy. The Hon. Minister announced that the NPP government would soon unveil new educational reforms which would focus principally at improving the quality of our labour force by reversing the high drop-out rates in our schools, revamping teacher training institutions and broaden the career choices for the youth. On foreign policy, Nana Akufo Addo observed that President Kufuor had succeeded in forging peaceful relations with all our neighbours for the first time in the nation's history and added that he was now the driving force in resolving conflicts in the West African Sub-region through his Chairmanship of ECOWAS. The Foreign Affairs Minister noted that the debt-relief accorded the country and the unprecedented programmes initiated to rehabilitate and equip educational institutions across the country was a clear vindication of the government's decision to adopt the HIPC initiative. To empower Ghanaian businesses to take a central role in the national economy, the Hon. Minister said Venture Capital Trust Fund and the Long Term Saving bill were passed by Parliament to provide long term finance to Ghanaian entrepreneurs. He commended the UK and Ireland branch of the NPP for donating four vehicles and 1,000 bicycles to the party and expressed the hope that they would marshall more resources to help the party to win a resounding victory in the 2004 elections. In his address, the Senior Minister observed that the monumental successes chalked by President Kufuor over the relatively short time in office were particularly remarkable because of the limited resources the government had at its disposal when it took office. Hon. J.H. Mensah said “everywhere you go in Ghana today, there are palpable evidence of change, and a change for the better” He said "those who close their eyes, like our friends in the NDC, cannot see what is happening around them"
The High Commissioner was optimistic that the good people of Ghana would throw their weight behind President Kufuor to win a second term since he had proved beyond all reasonable doubt his honesty and track record as a performer of the highest order. He said the NDC with the Sankofa slogan are telling Ghanaians that "backward ever, forward never"
Mr. Ampratwum Sarpong said it was incumbent on all supporters of the party to rally solidly behind the President to ensure that the flame of development and good governance lighted by the NPP government was kept aglow. “We should support and protect democracy and good governance in Ghana so that the good people of Ghana would continue to enjoy their fundamental human rights well into the future in the full assurance that their inalienable rights would never be whittled away by any dictator” declared the NPP Chairman of the UK & Ireland branch, amid cheers.